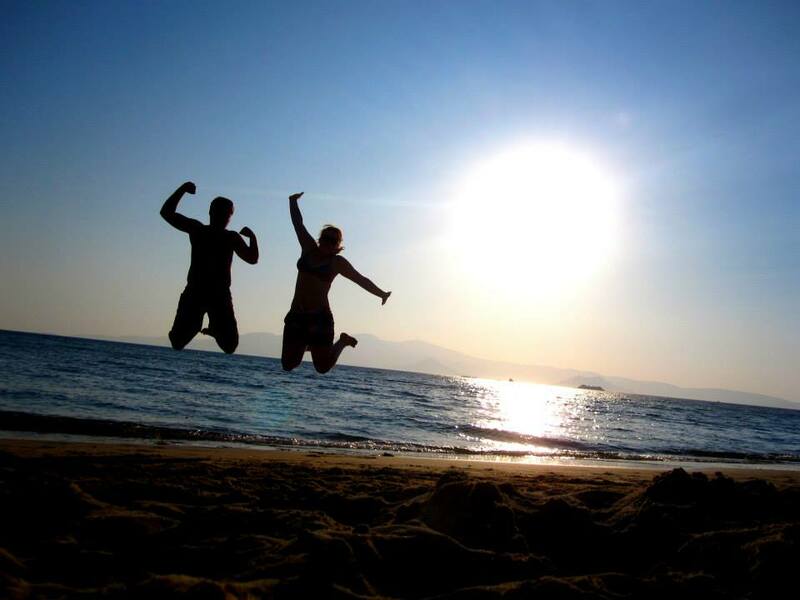 We awoke today to the fridge smelling of a strange mixture of gherkins and ham, and it was only later that we learned the ‘Stephfs’ had managed to invite themselves to a farewell party put on by the local restaurant for Greta and Jhaksa’s last Sail week of the Season. Apparently the tribe had not spoken when Stef’s ‘travel candle’ was blown out to send the leftover people on our boat to bed. If a drunken 5am feeding is a sign of a good night then I think the Stephfs nailed it! Nevertheless, we managed to circumnavigate the fridge and it’s open gherkin containers and find our breakfast, which consisted of some nuts and fruit, both fresh and dried. As we made our way from Sipan to Mljet, we were under the full sail for quite a bit of the journey along the coast, tacking only when we were within a few metres of the rocks. At one stage, the sharp turning caused the boat hook to go overboard and we thought it was only fair that Ryan – the King – and only gentleman on board not part of the crew, should dive in after it! A chivalrous effort and one that was celebrated with questionable Greek wine diluted with soda waters (don’t judge until you try it). We all sat on the deck in the sunshine talking and laughing. Plenty of “how good is this” moments. Soon enough we were pulling into our first swim spot and enjoying a nice paddle around, the Stephfs on their giant inflatable donut chairs they had apparently purchased at the Dubrovnik Marina grocery store on the first day (not going to lie, was extremely jealous). It wasn’t until we were about to leave the swim spot that I realised that Ellie and I had been here before a long, long time ago. In fact, we went for dinner somewhere on the island and had the best chargrilled fish and chicken. Anyway I digress. 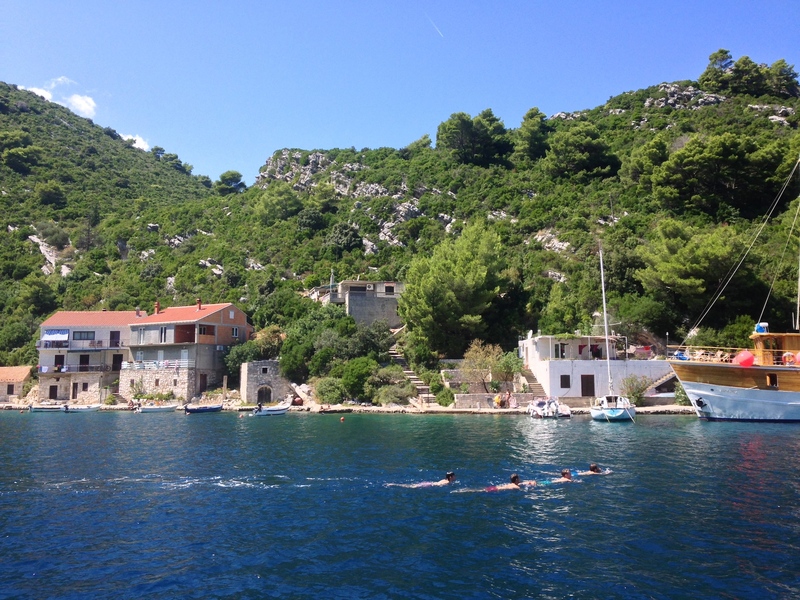 We continued toward the western tip of Mljet to the National Park. Greta told fantastical stories of an island within and island with a Monastery and one infamous Donkey, so we decided to make the trek and head for the middle of the island. Crammed into the little van, then onto a little ferry that crossed crystal clear waters, the experience was as Greta described. Except for one slightly important thing: there was no Donkey to speak of. Sure, there was a little barn and some hay spruced around the place, but still no donkey. We were deflated. It was here that we were first introduced to Bruce, an interesting fella who bordered on stalker. With Bruce in tow, we hopped on the next ferry to a couple of lakes and I copped an eyeful of the chest of the woman in front row as she casually rearranged her sarong in front of the entire boat. Everyone opted out of a swim in the lakes but Ellie and I had been distracted by a familiar looking girl – did we know her from home or was she on a previous tour? Finally, I cracked it: she was the Mole from the TV series that we watched religiously. We plucked up the courage and introduced ourselves and she was very friendly, despite her on-screen persona. Heated debate about transportation then ensured – do we walk, wait an hour for the bus or boat back to the Marina? Reluctance to wait became the deciding factor and we trotted along the lakeside fuelled by some take-away beers at a local tavern. It ended up being a bloody long distance, especially as the beers approached dregs, but Stephi kept us entertained with her whinging. After we were finally back aboard (and beat the sprinkles of rain that were creeping onto our skin as we negotiated the last downhill slope), we opened some nibbles (gherkins and other platters, of course) and then headed up to the local restaurant for lamb and octopus cooked in a bell covered by hot coals. “We are the cool boat” was proclaimed with increased frequency and volume proportional to the quantity of wine consumed. The boats were then transformed into mini-parties as we competed for music dominance and continued to drink into the wee hours. Jubilo was cranking out an old school rock mix, carefully selected by Stef and myself, which seemed to cause a brief rift between the Stephfs, resolved only with large quantities of paprika chips and a sleep on deck. Even Adam from the neighbouring vessel tried to get us to change to smaller speakers, which we vehemently denied. The lads were up to their usual antics, stealing chairs and jumping in and on the cars of the locals. Creepy Bruce made an unscheduled appearance, and Erin a sudden disappearance, hoping to reawaken at 1am but instead setting her alarm for 1pm and sleeping through the night. The music continued late into the evening and there was plenty of onboard bonding and friendships blossoming.